Ask anyone from Tokyo or other parts of Japan and they will always tell you that food in Hokkaido is cheap, but it's not just cheap, it's also the quality and freshness of the produce. Renowned for their fresh seafood, dairy and vegetables you know you going to get good value for your money. We had a great meal last night at this wonderful small izakaiya just a minute north of Sapporo station and it was so yummy. We had these egg rolls stacked up on this wooden stand and the waitress came over and sprinkled all this crab meat on top, it cost only ¥690(AU$7). 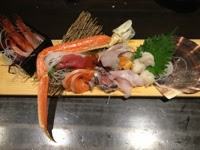 We also had sashimi which was so fresh, cost only ¥590(AU$6). A common thing we always encounter is we always sit next to patrons from Tokyo also enjoy their meal, all you hear from them throughout the meal is that you would have pay up to 3 times the amount in Tokyo, and not so fresh as it has to come from Hokkaido of course. 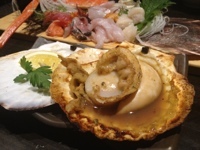 So when traveling in Hokkaido remember enjoy the great food and service from the friendly local people. KFC in Japan Much Nicer?